“Shalom Italia”, directed by Tamar Tal, one hour, aired on PBS POV on Monday July 24, 2017. The official site is here. The film shows three Italian Jewish brothers, now in their 80s, who revisit an area in Tuscany containing a cave where they hid during the Holocaust. They stop at a rural home for dinner and recount memories before finding the actual remains of the cave. They note living on one or two sardines a day, and developed allergies to it. Family members would go into a village and sell silver pieces to buy them food which was snuck up to the cave. This was a story of survival. At the very end, the brothers go back to a desert area in Israel, maybe near the Dead Sea. 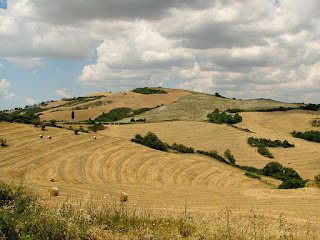 Wikipedia attribution link for Tuscany landscape by Norbert Nagel, CCSA 3.0.